Two weeks ago, unseasonably warm weather brought a surprise boom in maple production. 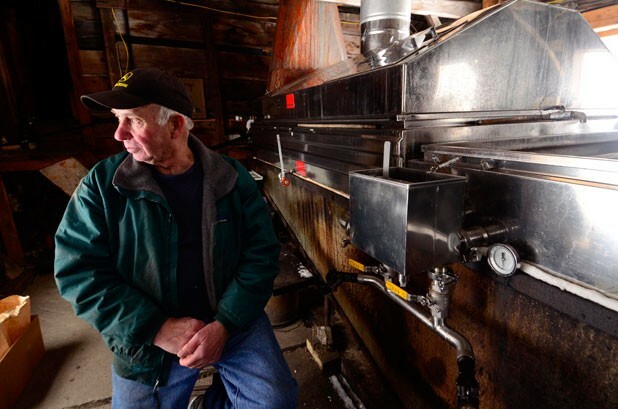 In Fayston, Robert Vasseur’s 5500 taps produced about 100 gallons of syrup in two days. Then the cold returned. Last week, the final vestiges of that sap were frozen upstairs in the sugarhouse the Vasseur family has used since 1932. Robert Vasseur was born that same year. His parents put their infant son in a box to keep him warm while they boiled their sap into syrup in the spacious shack. Now Vasseur, a Fayston selectman for more than 50 years, has record books dating back to 1954 showing how many gallons of sap were collected each day. He’s lived and breathed sugaring for 80 years, but 2012 is unique. It’s the year Vasseur could become a household name. Or, at least, his trees could. Vasseur is one of three Mad River Valley maple producers who have joined a pilot program called Tonewood — part commercial venture, part sustainability initiative. It’s the brainchild of Dori Ross, an Ontario native and former globe-trotting Gillette marketer who’s now one of Vasseur’s neighbors. Vasseur may seem an unlikely partner in an online business, but he has his reasons. “Dori kept pestering me,” he says with a shrug. Ross adds that she wanted to support her neighbor. She also enlisted Dave Hartshorn of Hartshorn’s Farm Stand & Maple and Eastman Long of Eastman Long & Sons, both in Waitsfield. “Easty is a latecomer. He’s only been doing it 35 years,” pooh-poohs Vasseur of the latter. The initial package this spring will arrive with a certificate of adoption and a picture of the sponsored tree. Hartshorn is giving his trees identifying markers using weather-resistant, cattle-ear-type tags on pipeline systems; Long says he’s named each of his. Subscribers will also receive a 16-page booklet about sustainability, reflecting the educational side of Tonewood’s mission. Ross plans to donate a portion of her profits to the University of Vermont’s Proctor Maple Research Center, where the first-time entrepreneur — who grew up sugaring — attended maple-grading school to learn more about her product. “I wanted to really help the maple industry by supporting climate-change research,” says blond, polished Ross over lunch at Waitsfield’s Big Picture Theater & Café. Climate change has profoundly affected small farms such as those of her producers, she explains, shortening maple season by as much as two weeks in recent years. Besides tracking the trend, the Proctor Maple Research Center is developing tools to increase productivity. Vasseur’s farm is already benefiting from his collaboration with Ross and Proctor: All his trees are now outfitted with check-valve spout adapters. Each of these “results in higher yields than normal,” says Proctor’s director, Timothy Perkins, one of the system’s inventors. “It keeps the bacteria from getting back into the tree every time you put a hole in the tree.” Better for the tree, better for the farmer. Acres of maple trees sporting bright-blue valves may not be particularly glamorous, but the packaging Ross has developed for the Tonewood product is. A few months after the initial adoption notice, the first delivery of syrup will arrive in black boxes designed by a Boston-based, Swedish-owned firm. Ross, who is essentially a one-woman operation, has chosen to package the syrup in chic glass bottles that highlight the dramatic color differences in the four grades. More importantly, her research revealed that glass best maintains the syrup’s freshness. The four-pack of 250-milliliter bottles includes each American grade: Grade A Light Amber (often called “fancy”), Grade A Medium Amber, Grade A Dark Amber and deep, dark Grade B. Each tree produces all of the grades at different times, starting the season with ethereal-tasting fancy and ending it with the big, sucrose-rich flavor of Grade B in warmer weeks. The four-pack gives customers a chance to experience maple in all its subtle variations and choose a favorite. Vasseur did that long ago. Last year’s chilly spring resulted in a season heavy on fancy syrup for him, and he disdains any other choice. “What I say is, you don’t have no taste,” he says upon learning that this reporter prefers Grade B. In the fall, Tonewood customers will sample value-added maple products with their third shipment, “Sweet Pairing.” The box contains two smaller boxes, one filled with maple wafers crafted by sugar maker and confectioner Colleen Palmer of Jeffersonville. The delicately packaged candies are a smooth, grown-up equivalent of the leaf-shaped treats sold at maple festivals. In the other box is a maple-sugar cube that comes with the world’s cutest, tiniest grater. Ross says she uses it to grate sugar onto her morning cappuccino, as well as on fresh berries and granola. For those not ready for the commitment of adopting a tree, Ross will sell maple products à la carte in “liquid” and “solid” sections of her website. Besides syrup and treats from the packages, they’ll include containers of sweet maple flakes, decadent maple cream and a savory seasoning that combines maple dust with salt, pepper and garlic powder. The seasoning is part of Ross’ measured attempt to make maple a regular part of mealtime. She calls the sap a superfood, referring to a University of Rhode Island study that identified 54 beneficial compounds in maple, including five not previously seen in nature. One Tonewood package will contain a booklet with recipes contributed by Vermont chefs, but Ross also envisions producing a full-length book. The Tonewood Facebook page regularly features links to maple recipes, both sweet and savory. On a blog, Ross will invite adopters to contribute their own, creating something of an online maple community. Just don’t expect Robert Vasseur to be joining the conversation. “That’ll turn people off,” he says of the notion that he might develop a bigger internet presence. If Vasseur’s salt-of-the earth solidity is the old guard of maple production and distribution, perhaps Tonewood is its 21st-century face. “What I want to do is take a wonderful, completely natural foodstuff and elevate it to the level of sophistication that it deserves,” Ross says.